The Irish girlgroup Sheeba was formed in 1977 by Maxi, Marion Fossett and Frances Campbell. 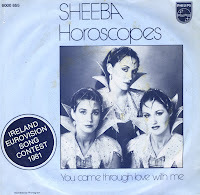 In 1981 they represented Ireland during the Eurovision Song Contest with the song 'Horoscopes'. It finished fifth in a field of 20 contestants. Following their exposure in the 1981 contest, they signed a recording contract in the UK and released the singles 'The next night' and 'Mystery', neither of which found success. In 1982 they were involved in a road accident in the West of Ireland that brought their career to an eventual halt due to their reluctance to continue touring. Today, Maxi is a successful broadcaster with RTE in Dublin; Marion Fossett is ring-mistress of the well-known family circus, Fossetts; and Frances Campbell is a broadcaster in Northern Ireland.